What's the best and what's the rest? Although quite thin, Chance glass is tough but susceptible like any other glass to chips and scratching, so only pristine glass	is	really	worth	collecting, apart from the real rarities. Much	of	the	Fiestaware	range	also	has	gilt	edging	that is particularly prone to rubbing and wear, while the transfer itself	can suffer from scratching and wear marks. So although finding this glass in immaculate condition is not too common, some can still be obtained	in the original box and with the stickers still intact, signifying the item was probably	just used for display	purposes. Of the commonly-known patterns, Swirl is desirable and popular as	a	true	1960s retro	pattern,	it is also fairly common so only the more unuusal shapes will command a better price. Calypto	is also regularly listed	on eBay. The	most	sought-after (commonly-known) Fiestaware is probably 'Night	Sky' although other patterns should never be disregarded: Greco, particularly Blue, is extremely elegant and the coloured Lace patterns are often very hard to find. So... what do you call a Carafe? 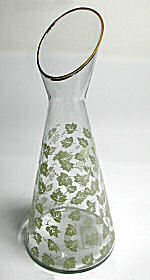 Of all the types of glass, there is no doubt the aptly named 'Giraffe' Carafe is very popular and always in demand. Printed in just four designs (known to date), there appear	to be two different shapes; one tapers straight down to the base in a cone shape, the	other (far rarer) version tapers out before angling back to the base,	giving it a slight	belly. (Lady) Margaret Casson (Night Sky & Green Leaves) was married to Sir Hugh	Casson	and	also	created ‘Cannes’ and ‘Riviera’ designs for Midwinter	pottery. Michael Harris worked at Chance in a freelance capacity during the summer of 1959, producing many designs although it is unknown	how many were actually used (Calypto & Anemone are known as commissioned work). In 1962 he took a tutoring post with	the	RCA until	1968, before leaving	to	form Mdina glass (Malta, 1968-72),	then Isle	of Wight	Glass (1972-94). See GlassyEye.com for more. Geoffrey Baxter, later of Whitefriars fame, designed many 'intaglio' dishes in 1953 for his degree show	at the Royal College of Art and used ruby- and blue-flashed blanks manufactured	by	Chance. During the 19th Century, Chance was also well-known for their exquisite stained glass	windows that	featured in many	prominent buildings. For more on the technological side of glass, datasheets	can	be	downloaded	from Pilkington's site.